When it comes to celebrating Cinco de Mayo, there are a few directions you can take. First, you could ignore it, because it’s just a Wednesday and you don’t even know what it’s about. Second, you could consume far too many margaritas at your local cantina, after which you still have to get up and go to work on Thursday. Third, and I’ll allow that this is an unconventional idea, you could really mess up a French recipe in honor of the French’s defeat by the Mexican army in 1862. Or fourth, and this is the method I recommend, you can make some great Americanized Mexican food, because doesn’t that really capture the spirit of the holiday? 4 corn tortillas, as fresh as you can find them. I get some that still have steam in the bag from a tortilla factory near me. Warm your oven at it’s lowest setting to keep the plates and tortillas warm while everything else is prepared. Wrap the tortillas in foil or put them in a cast iron skillet and cover with foil in the oven to warm. Have the cilantro, scallions, avocado, nopal, and cheese ready. Heat a drop of oil or butter in a small nonstick skillet, and crack 2 of the eggs into it. After the whites have begun to turn opaque, pour a little of the salsa and a teaspoon or so of water into the pan and cover. Cook until the whites are firm, and the yolks are still a little runny. If you have two skillets and the skills of a short order cook, try cooking all the eggs at the same time; otherwise repeat with the other eggs. To assemble, place two tortillas on a dinner plate. Spread half of the beans onto the tortillas and top with the eggs. Pour half of the salsa over the eggs, grate a little cheese over the top and sprinkle with the cilantro, scallions, avocado, and nopal. So if you were going with option number three, what recipe would you recommend? Kidding! I almost had huevos rancheros Monday night. It must be a sign I need to make it. 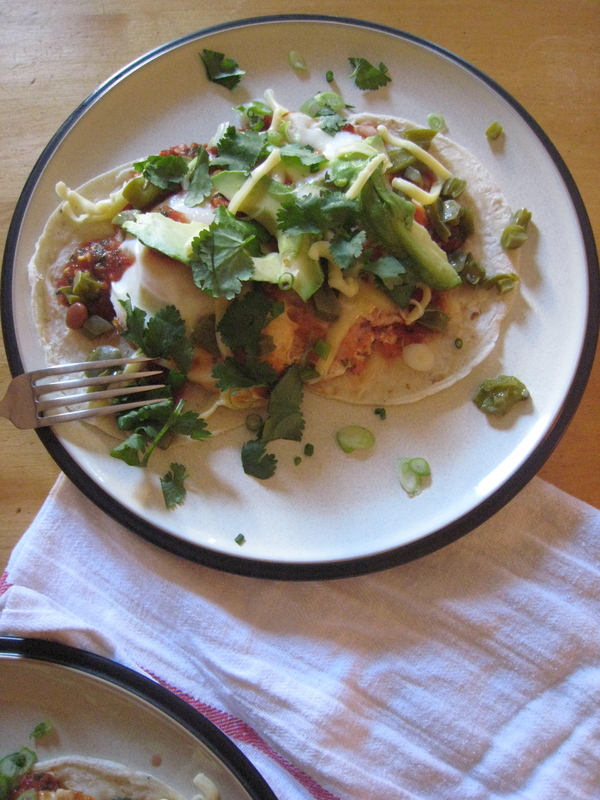 I had Huevos Rancheros for the first time on our visit out to NM earlier this year to visit our dear friends…..oh my….I will definitely give your recipe a try!! Looks delicious!